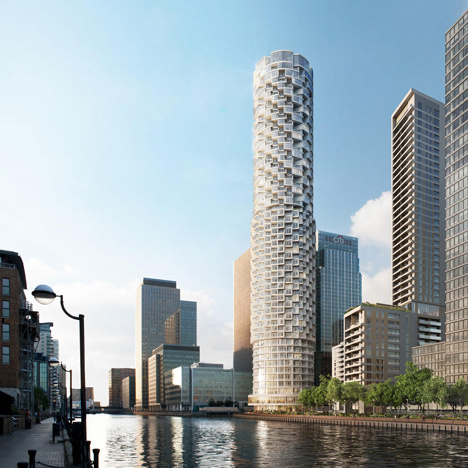 News: Swiss architects Herzog & de Meuron have designed a cylindrical skyscraper as part of a nine-hectare masterplan proposed for London's Canary Wharf. The residential tower is one of five new buildings proposed at Wood Wharf, the eastern end of Canary Wharf, in the first phase of a major mixed-used development submitted for planning approval today by London architecture firm Allies and Morrison. Herzog & de Meuron and London studio Stanton Williams are working on the three residential buildings of the proposal, providing a total of 884 homes, while Allies and Morrison has designed two office blocks targeted at creative media, technology and telecommunications companies. Later phases of the masterplan aim to surround the new buildings with a network of public squares and parks, as well as over 100 shops, restaurants and cafes at street level. Additional buildings will accommodate education and healthcare facilities, while more residential accommodation will bring the total of new homes up to 3100. George Iacobescu of property developer Canary Wharf Group commented: "This is an exciting new project for Canary Wharf Group which represents the continued redevelopment of east London almost 30 years after the original transformation of Canary Wharf began." "The revised masterplan will create a strong and complementary mix of uses, and provide new homes, offices and retail spaces set within a network of streets and public spaces, designed to support the social life of new residents, employees and the surrounding community," he added. If planning approval is granted, construction of the phase one buildings is set to commence next year, with completion scheduled for 2017. » Illustrative design information for Phase I to include 884 residential units in 3 buildings designed by Herzog & de Meuron and Stanton Williams totalling 100,379 sq. m (1,080,179 sq ft) (GIA); and 2 office buildings totalling over 20,000 sq. m (216,000 sq.ft.) (GIA) designed by Allies and Morrison. All three architectural practices are internationally acclaimed and award winning firms of the highest calibre (see notes below). Canary Wharf Group plc (“Canary Wharf Group”) today announces that it has submitted planning applications for, a new 9.23 hectares (22.8 acres) mixed-use urban neighbourhood immediately east of Canary Wharf in central London. The new masterplan proposes the development of more than 3,000 homes and over 240,000 sq. m (2.57 million sq.ft.) (GIA) of commercial offices offering a range of floor plates that will appeal to a wide array of occupiers including the fast expanding TMT sector. "This is an exciting new project for Canary Wharf Group which represents the continued redevelopment of East London almost 30 years after the original transformation of Canary Wharf began. The revised masterplan will create a strong and complementary mix of uses, and provide new homes, offices and retail spaces set within a network of streets and public spaces, designed to support the social life of new residents, employees and the surrounding community. It is a reflection of the demand we are seeing in the market, and is an opportunity for us to further expand the appeal of Canary Wharf by creating a new and exciting mixed use neighbourhood at Wood Wharf which will offer greater diversity and amenity and a richer urban fabric for the fast emerging City Centre of Canary Wharf." A range of house types are proposed for 3,100 residential units, including town houses and mid and high-rise apartment buildings. Housing tenure will include private housing for sale and rent and intermediate and affordable housing for rent. The planned offices will be capable of accommodating a wide range of company sizes and types, in line with the mixture of demand we anticipate including the expanding TMT sector in East London. This vibrant, new development is expected to create over 17,000 new jobs, of which we expect around 3,500 will be taken by local residents. The broad range of public spaces, homes, offices and shops is designed to offer a rich and diverse working and living environment. This diversity is a key element of the new Masterplan. The shops and restaurants will include a range of names new to London to further expand Canary Wharf’s broad retail offer. The Masterplan provides for two hotels and serviced apartments. The scheme also includes 3.6 hectares of interconnected public spaces with two squares and two parks, one based on a typical London square, the other lining the southern dock edge of Wood Wharf with 1km of dockside boardwalks. Plans for Wood Wharf include a two-form entry primary school, a multi-purpose sports hall and a healthcare facility. The highly successful Arts and Events Programme at Canary Wharf will be expanded and will offer a range of cultural activities and events in new venues and the planned public spaces at Wood Wharf. Transport considerations include the installation of London Cycle Hire bicycles, a new bus route through the site and improved pedestrian connectivity to London Underground, DLR & Crossrail. Two car clubs are planned along with parking for 1,100 spaces. "With an extensive new network of public spaces and water’s edge boardwalks, the Wood Wharf masterplan places high quality public space at the heart of the design process. The principle achievement of the masterplan – the ‘glue’ which holds the neighbourhood together – will always be its well-considered network of streetscapes, squares, parks and water spaces. We are building a community that will both support, and be supported by, the success of Canary Wharf and the 110,000 people that work and visit Canary Wharf each day." Herzog & de Meuron and Stanton Williams have been appointed to work alongside Allies and Morrison in designing the first phase buildings within Wood Wharf. If planning permission is granted, construction is expected to start in Q4 2014 with the first buildings to be completed in 2017.